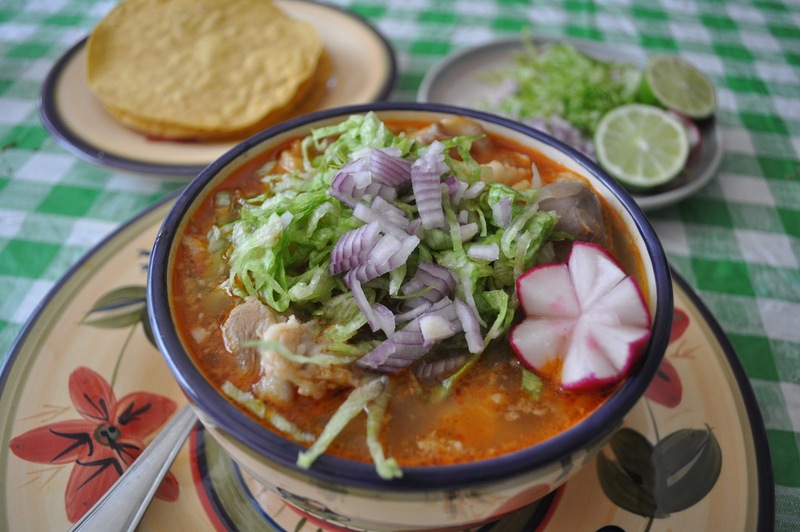 Pozole is one of the most traditional and delicious (in my humble opinion) meals in Mexico! This soup is a meal in itself, for its character and flavour fill you up! Rinse the corn very well, then tip into a casserole filled with water and add the head of garlic. Cover and cook on low heat until the corn is soft. Cook the meat with ½ onion and salt until it’s very tender. Next, cut the meat into strips or small cubes. Deseed the ancho chillies and then roast on a dry pan, turning the sides until they are evenly cooked. Next, place in a medium heatproof bowl. Add boiling water, cover and let sit for about 30mins or more. Remove the chillies from the water and blend until smooth, strain into the casserole where the corn is. Add the meat into the casserole where the corn and chillies are, along with a bit of the broth from the meat. Season to taste. Let everything boil together for about 15mins, for the pozole’s broth needs to be thick. Serve very warm, accompanied by the toppings. Tip: crush piquin chillies over the pozole to give it more flavour and a bit of spice factor. Add toppings to taste! For the vegetarian version, substitute the pork and its broth for vegetable broth. Simply dissolve one or two vegetable cubes in 2 cups of boiling water, adding more or less water to taste, and add an extra 100g of corn if desired.